A wee living room gig for justice & peace. Paul Baker Hernandez is an indefatigable peace and justice activist, who wields his beautiful self-crafted guitar, songs and stories in order to protest against harmful activities of corporate and international interests and war and to campaign for oppressed peoples and the planet. 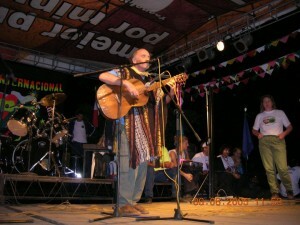 The life of this profoundly gentle, but deeply passion- ate minstrel, has moved from the UK – and Scotland in particular, when he was a monk and then early advocate of world development, fair trade and com- munity building – to living today in Nicaragua where he works with Echoes of Silence. The project’s aims are ‘Peace, Justice, Beauty. One Planet. One People’ and it works to improve the lives of children, women and others through creative programmes, appropriate technology and cultural celebration. Paul will present an evening of songs and stories imbued with joy and anger, work and struggle, profound hope and the irrepressible signs of justice and life in all its fullness. Hosted by Holy City and the Wild Goose Resource Group of the Iona Community. Drinks and nibbles will be available (but also BYOB). A donation to Echoes Of Silence of around £10 is suggested, or more (or less) as you feel able to give.